The Best Buy Canada Gaming Invasion event is taking place for a 3rd straight year at the Yonge-Dundas Square in Toronto from Friday, October 17th to Sunday, October 19th. Some of the games to be featured at this event include Gears of War 2, Guitar Hero World Tour and LittleBigPlanet. This means you can experience these gems before they even hit the streets. Gaming tournaments are planned and people can compete for some great prizes. Canadian rock band Mobile will also be performing live on Friday, October 17th at 6:30pm. 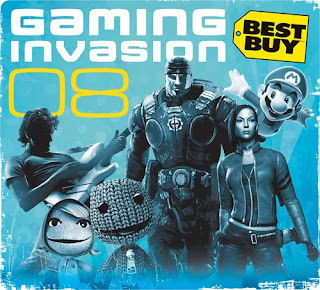 For more details visit the Best Buy Canada Gaming Invasion 08 page. Man I read about this last Friday in the BB flyer, wish I could go. Nice, I should be able to make it out to the event. Thanks for the heads up Drew!